Kick-starting my March events was the launch of The Bitter Twins by Jen Williams, the sequel to the Ninth Rain. As an avid reader of YA Fantasy with an interest to delve further into the Adult version of the genre, I couldn't have picked a better series to start with and it was an incredible honour to be part of the blog tour! Jen and I had an interview where she gave great insight into her writing and even reveals which scenes she's most eager for readers to experience from her new release. If you follow my currently reading updates on twitter you'll know how utterly in love I was with Scythe so upon hearing that the author, Neal Schusterman was coming to London for a tour stop I freaked the heck out. Unknown to me however, a mere author panel is not what I would be doing that Monday. Walker publishing asked me to interview Neal prior to the event! 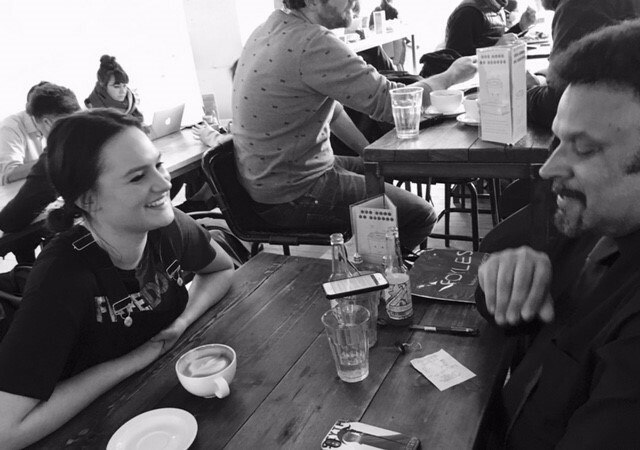 It was probably the greatest opportunity to be presented with as a blogger as I had the chance have a casual sit down coffee interview where we talked about writing processes and inspirations for Scythe as well as a video where we sorted the characters into Hogwarts houses and discussed the upcoming movie adaptation of Scythe. Neal is an incredible person to speak to, his insights into writing fiction are very intriguing (he still handwrites first drafts!) and talking to an author surrounded by writers and readers provided a very atmospheric environment. I don't need to tell you how official I felt with my recorder balanced on a glass. At Crouch End Waterstones, Neal was joined by Samantha Shannon and VE Schwab, the authors of the Bone season and A Darker Shade of Magic, respectively, to discuss dystopian fiction. 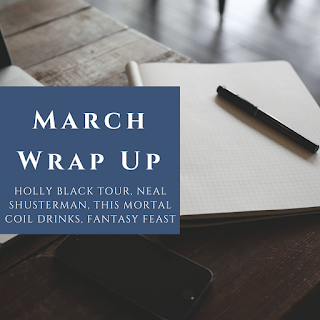 March was most definitely a sci-fi/fantasy filled month as Holly Black was also touring the U.K.! First up, was a Waterstones Piccadilly event where Holly spoke on a panel, sharing fairytales and delving deeper into how she comes up with some of her plots. For the record, a lot of it happens on long drives! 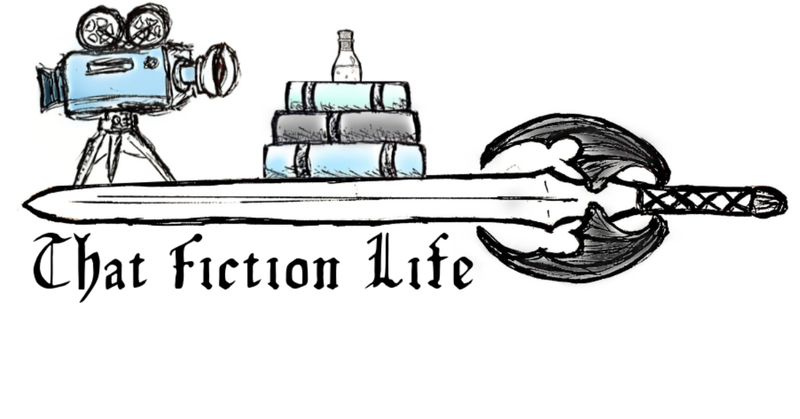 The next day Hot Key Books were angels and hosted a Blogger Banquet with Fantasy authors, Sebastien de Castell, Alexandra Christo and Holly Black. We were greeted by a tequila cocktail upon arrival, so you can imagine how excited I got, it being my favourite spirit. We were treated to a full course meal, with the authors sitting switching their seat after each course so we could interact with them all. It is needless to say that when Holly Black joined my table, I had never been so disinterested in food in my life. After the dinner it was great to speak to Sebastien as his books sound right up my street (all about magic!) and it should come as no surprise that when he asked for a book recommendation I practically forced Gilded Cage into his TBR. My book pushing is reaching authors now you guys. We also had a long-running joke that he was trying to hoard all the cupcakes, can you love him more?! Prior to the feast, I filmed a video with Holly (I KNOW RIGHT CAN YOU EVEN), where she gave a lot of hints into The Wicked King, the sequel to the Cruel Prince and some insight into a possible Coldest Girl in Coldtown continuation. I have yet to edit that video so you guys have a lot of content to look forward to. To round of the month, Penguin blessed me with an invite to drinks with author Emily Suvada at Purl London. What began as any other hang out turned into a group therapy session where we all low-key changed our career aspirations. It was the best type of career counselling. The venue was the most epic location considering Emily's book is sci-fi with a heavy dose of chemistry, the drinks each had a different trait that had our minds truly blown. Hogwarts worthy and most likely Snape approved concoctions, some emitted smoke while some were accompanied by detonating balloons. Emily's debut, This Mortal Coil, is a YA novel perfect for all the chemists and science-adoring geeks out there, being heavily focused on genetics. A hacker for a protagonist is an ideal person to carry a plot full of betrayals, kidnappings and apocalyptic virus threatening the human race. Doesn't that sound all fiendish and fun? Check out further details on Book Depository or Amazon.